About Us - GARP's History and the GARP Concept of service. We were born in August, 1993 as GARP - the Great American Rideshare Program, part of California's Clean Air Act and state-mandated employee rideshare program. Published monthly in both English and Spanish, the GARP Gazette's bright and breezy, easy-to-read style made it a hugely successful component of California's clean air campaign. We soon realized that if we could make rideshare interesting, we could make anything interesting. So in January 1996 we established ourselves on the World Wide Web and began to GARP the globe as Good And Ready Publications. 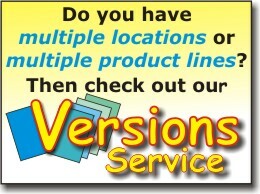 Now we provide comprehensive, custom newsletter services to a wide range of businesses and organizations. They include law offices, Realtors, veterans organizations, mortgage brokers, insurance agents and auto dealers. We invite you to check out our References. With the advent of electronic newsletter production, the newsletter business took a giant leap forward, and so did we. Proofing changed from a laborious, time-consuming and often frustrating operation, to a super-efficient process that did much to improve the overall quality of the finished publication. Electronic production and distribution is not only vastly more cost-effective than traditional printing and mailing, it also provides lightning-fast delivery. However, despite the technological advances, we remain a custom newsletter house and cling to the traditional values we began with. We also proudly service the many companies who still find that the solid, physical presence of a quality printed newsletter, distributed by US mail or handed out by reps on the road, remain their best option. We all genuinely feel that what we have to share about our own particular business is both fascinating and important. Strangely, many of those we know would benefit the most from reading this information tend to become bored, and can tune out. The result is that many newsletters are tossed away unread. Worse, if we persist, we risk annoying and even alienating the very people we hope to attract. For a commercial newsletter to succeed it must entertain as well as inform. The real purpose of sending out a newsletter on a regular basis is not really to sell a product, service or point-of-view. It is to create enough interest in your organization to prompt an interested contact. It may take several issues, but you certainly don't want to lose them before then! 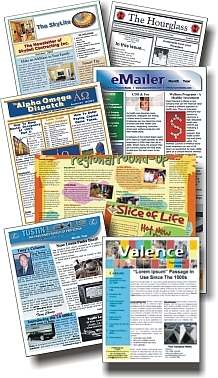 We have been creating interesting and effective custom newsletters that get read since 1993. So if you would like to generate more responses from your mailings, we know how to do it. 1. First go to our Designs Page and choose a design that best suits your purposes. 2. Next eMail us some details of the newsletter services you require, and we’ll take it from there.